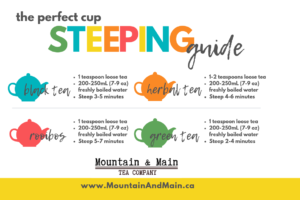 Ever wondered how long to steep a tea? There’s nothing worse than weak tea or tea that’s gone bitter from steeping too long! While most teas come with a personalized guide, here’s a quick glance of how much & how long to steep tea to get that perfect cup! Now head on over and pick up your favourite tea to get your perfect cup! LOVED the blueberry tea with a touch of honey and cream – and I’m generally not a fruit-tea drinker either!